We represent international networks that have been focusing for many years on human rights, occupational health and environmental health in the global electronics industry. We stand in solidarity with SHARPS during their historic 600+ day sit-in at Samsung. 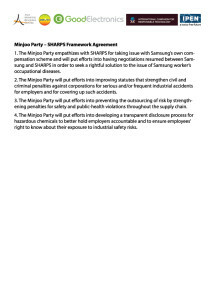 The recent framework agreement signed by the Minjoo Party and SHARPS (see below) provides key objectives for worker safety policies including right-to-know, protecting sub-contractor workers, and strengthening enforcement and penalties to increase corporate accountability. We encourage the Minjoo Party to begin work to concretize this framework as soon as possible. 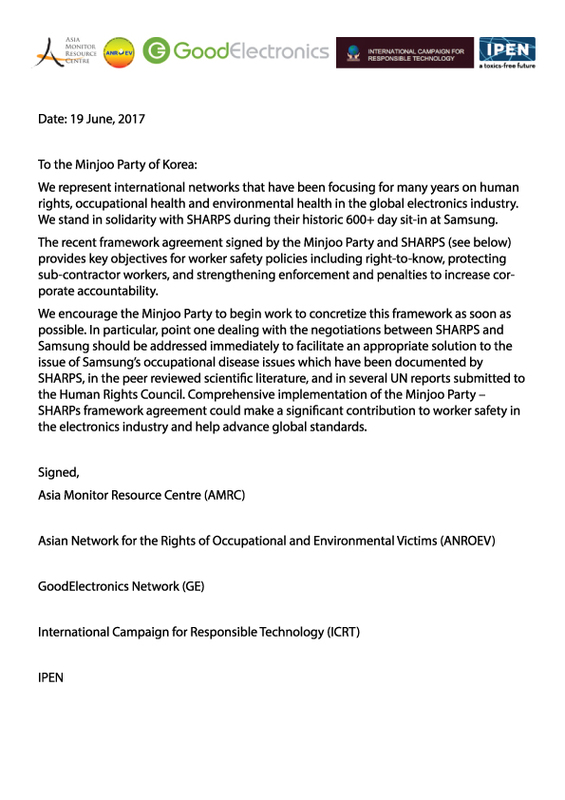 In particular, point one dealing with the negotiations between SHARPS and Samsung should be addressed immediately to facilitate an appropriate solution to the issue of Samsung’s occupational disease issues which have been documented by SHARPS, in the peer reviewed scientific literature, and in several UN reports submitted to the Human Rights Council. 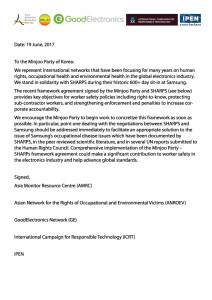 Comprehensive implementation of the Minjoo Party – SHARPs framework agreement could make a significant contribution to worker safety in the electronics industry and help advance global standards. 1. 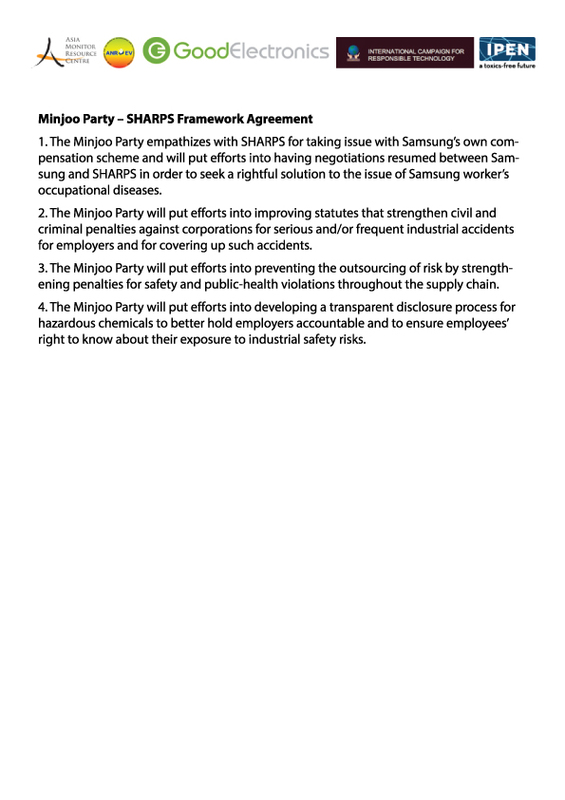 The Minjoo Party empathizes with SHARPS for taking issue with Samsung’s own compensation scheme and will put efforts into having negotiations resumed between Samsung and SHARPS in order to seek a rightful solution to the issue of Samsung worker’s occupational diseases. 2. The Minjoo Party will put efforts into improving statutes that strengthen civil and criminal penalties against corporations for serious and/or frequent industrial accidents for employers and for covering up such accidents. 3. The Minjoo Party will put efforts into preventing the outsourcing of risk by strengthening penalties for safety and public-health violations throughout the supply chain. 4. The Minjoo Party will put efforts into developing a transparent disclosure process for hazardous chemicals to better hold employers accountable and to ensure employees’ right to know about their exposure to industrial safety risks. June 5, 2017, Karachi: The management at Pakistan’s leading brand Khaadi has had two meetings with representatives of trade unions in the past two days regarding a draft related to rights, minimum wage and social security of the workers. According to secretary general of the National Trade Union Federation (NTUF) Nasir Mansoor, the terms and conditions of the draft are being finalised. He said that the brand “came forward with the understanding that there were problems which needed to be addressed, which is a good sign”. The meeting between Khaadi representatives and trade union members also touched upon issues related to “safety, security and health of workers and old age benefits”, Mansoor added. Khaadi representative Imran Shiwani was approached for comment on the meeting, but he switched off his phone soon after agreeing to make a comment. Khaadi’s deputy general manager for administration Irfan Dalia said that “as a brand we don’t encourage unfair labour practices”. However, when he was contacted to speak about the recently held meeting, he was unavailable for comment. The meeting comes after social media posts by activists and bloggers pointed out the lack of coverage in the national media about protests by Khaadi employees since May 22. The issue itself came to the fore after a number of workers belonging to the leading apparel brand took to the streets in Karachi, Lahore and Multan to protest ill treatment meted out to their colleagues in Karachi. According to a union representative, Usman Ali, 32 workers had filed a form pertaining to unionisation at the National Industrial Relation Commission (NIRC), Karachi bench, which acts as a labour court. The reason the workers had approached the court was to ensure employment security after they apply to form a union. According to experts, a registration order has to be acquired from the NIRC which also ensures job security for the workers in case the employer decides to sack them. However, NTUF’s Nasir Mansoor adds that the brand is now using the name of a third-party contractor, Texmark, which is said to be dealing with the hiring and sacking of employees working at Khaadi. “I must add here that 90 per cent of our garment industry deals with their workers in a similar manner. There are no set rules, no benefits and a minimum wage of Rs13,000 or even less is given to the workers,” he said. June 5, 2017: Nearly 10,000 South Koreans have suffered or are suffering from diseases related to environmental factors — many of them lung-related diseases — in the past decade, government data released by a civic group showed Sunday. According to the Asian Citizen’s Center for Environment and Health, in one fourth of the 9,853 reported cases, victims died. Of the total, 2,467 were recognized by the Environment Ministry to have asbestos-related diseases. About 40 percent or 1,006 of the victims have died mostly due to lung-related diseases. Asbestos is defined as a carcinogen by the World Health Organization, as exposure to worn out asbestos materials can cause diseases such as lung cancers and mesothelioma. Asbestos was widely used in the 1970s here to build slate roofs, interior materials, soundproof walls and insulators at low costs. Despite the ban on its use for construction material, there are still a large number of buildings that contain asbestos in the country, posing health threats to citizens amid the frequent redevelopment and reconstruction of such buildings, the report said. Also, the total number of 5,615 victims, including infants, pregnant women and elderly, have filed damage reports to the government as of May for having suffered from the use of toxic humidifier disinfectant. About 21 percent, or 1,195, of them have died since August 2011 when the government officially confirmed the link between the health damages of victims and the toxic substances widely used to sterilize humidifiers here until six years ago, the report said. A recent state-led survey estimated that at least 3.5 to 4 million Koreans had been exposed to the toxic humidifier disinfectant. 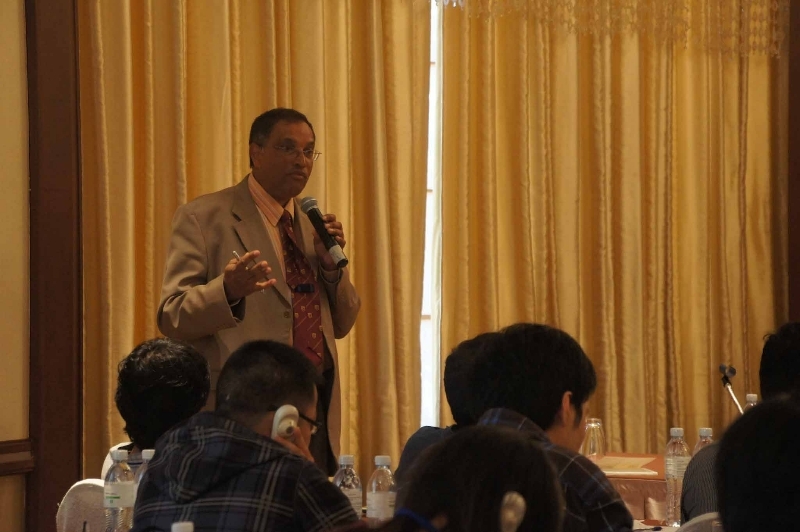 The report also mentioned that 1,763 victims who live around 11 cement factories across the nation and reported their lung-related sickness since 2007 were turned out to having suffered either lung cancer, pneumoconiosis or ventilatory failure. Eight others who reported their difficulty of breathing to the National Institute of Environmental Research were residents living near a briquette manufacturer in southern city of Daegu, the report said. Choi Ye-yong, head of the ACCEH and publisher of the report said that large number of victims from toxic humidifier disinfectant as well as asbestos-related diseases are still suffering other long-term health illnesses and underlying diseases. “While the most common environmental diseases were both lung-related and closely linked to inhaling the polluted air, the government should come up with stronger measures to provide practical damage treatment, not only tallying up the damage figures,” Choi told The Korea Herald. An independent investigative body to manage the damage reports and provide medical treatment based on law should be established to control the number of victims suffering from disease caused by exposure to toxic chemical products or environmental factors, Choi added. May 8, 2017: A judge in Britain has fined Barroerock Construction Limited £750,000 — about $972,000 in U.S. dollars — and ordered the construction contractor to pay costs of £14,874.68 for repeated asbestos violations, the Health and Safety Executive reported. The court heard details of two HSE investigations at a single site in 2013 and 2014 where Barroerock workers were converting a nine-story office building into apartments in Kent. The building was known to contain asbestos, according to the agency. The first investigation was a routine inspection during one of HSE’s refurbishment campaigns; HSE says as many as 40 workers were exposed to asbestos during the early demolition phase of the project. The second investigation brought a visit to the site in June 2014 after complaints were made about health and safety practices at the site. May 7, 2017: The 8th Conference of the Parties to the Rotterdam Convention (COP8) ended on May 5, 2017. 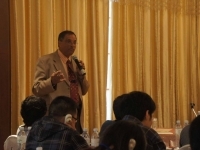 It will be two years before the next conference takes place in 2019. Ever since the Convention came into beginning, the asbestos industry has refused to allow chrysotile asbestos to be put on the Convention’s list of hazardous substances, even though chrysotile asbestos meets all the criteria for listing. At COP 8, once again, a handful of countries, led by asbestos exporters, Russia and Kazakhstan, simply refused to allow the rights contained in the Convention to be implemented by refusing consensus. Frustrated by the asbestos industry’s endless sabotage of the Convention, a group of twelve African countries put forward an amendment to the Convention at COP8 that would allow a 3/4 majority vote to take the decision to list a hazardous substance, when consensus proves impossible. This amendment would end the ability of a small group of countries to sabotage the Convention in order to protect industry profits. In other words, after a decade of sabotage of the Convention and failure to take action to address the sabotage, the Parties to the Convention will spend another two years discussing the problem and will “consider” the problem at the next conference in 2019. This endless failure to act sends a message that the double standard continues to rule in the world and that the lives of populations in the Global South are provided lesser rights to be protected from harm from hazardous substances than the rest of the world. In addition to chrysotile asbestos, the listing of carbosulfan, fenthion, and a paraquat formulation was blocked by a small number of countries.